‘The Boy in the Gap’ is Paul Soye’s debut novel . I recently finished reading it. It’s a literate, thoughtful and highly-engaging story which is set largely in-and-around my locality here in County Mayo. Having committed a shocking crime, Jack Sammon waits in his cell for the conclusion of his trial. While waiting, he sets down, in a copy-book, the events of his life which has lead him to this moment. As you may know, I dislike revealing much about any story – which makes my reviews fairly odd affairs at the best of times. In this case, I find my best way into discussing the book is via some of the comparisons which have already been made about it and then perhaps adding a rather strange comparison of my own. Paul’s book is newly published but has quickly garnered interest in literary circles as well as among a wider reading audience. Almost immediately, comparisons have been drawn between his writing and that of some of our greatest story-tellers. Pat McCabe for one, although I must say I don’t quite see this. He has given us memorable criminal characters in his time, it is true, but for me Paul is sailing on a somewhat different tack to Patrick. John McGahern is also evoked as a comparison. To me, this one seems to be somewhat more pertinent. The comparison is certainly valid on that rather superficial level that both John and Paul can write with great heart about the ways of the Irish Countryside. For a man who started out a city-boy, Paul Soye has embraced rural living to such an extent can one can practically smell the warm evening air or hear the muddy plop of the cattle's hooves in the lane. His writing of ‘country’ is sensual and knowledgeable and utterly unsentimental. It is a most striking aspect of the book. But I feel that the comparison to the great John McGahern can go a little deeper. I think it comes down to honesty. Like John before him, Paul seems to have succeeded in hard-wiring his writing into a place of painful unflinching honesty. Perhaps this is not the case, perhaps it is the guile of a great writer to make us believe that the untrue stories they sometimes tell are bourne from their heart. Whatever the case, the overriding impression that I got from this book was that the writer had drilled deep into what he feels and what he knows to get his story made. The result is a compelling, insightful and ultimately tragic work. So, now, let me add my own literary comparison to the weight already around poor Paul’s neck. My reason for doing so is to allow me to write a little about Jack Sammon – the character around whom this entire novel revolves. For me, Paul is most reminiscent of J.D. Salinger and, in particular his book, ‘The Catcher in the Rye’. This is a personal opinion and many may disagree with me. My reasons are simple. Both Paul and Jerome have written a character who is both fascinating and frustrating in equal parts. My reaction to both characters is very similar; I feel that both are only one tiny notch away from being well and happy and, given the opportunity, I could ‘fix’ them. This is a measure of how involving the character of Jack Sammon became for me in Paul’s’ book. I really thought I could fix him. He had a difficult life, his father’s death in murky circumstances, his mother seconded to another man by her need for companionship and validation, his isolation and his wayward spirit. I think Paul dangles the possibility of an alternate happy life just within Jack’s grasp. He shows us how natural and at home he is within the everyday graft of farming work, how the necessary skills and fine-touch are bred into him and there to be used. But, frustratingly, Jack is not permitted to settle into this route through life. Instead, he is thrown out into the world. A world where he operates successfully and well except for that one degree of oddness within him. That one degree, which the livestock and the farmland would have soaked up effortlessly, becomes, in London’s fallow streets, a thing to fester and metastasise. The final striking thing I would say about Jack is how he is very much from our time, not some brown faded past. This is striking in the book at times, particularly early-on where the language and setting evokes an Ireland of long long ago yet there are remote controls for the TV and CD’s and Sky Television. This is not a story from some other era, as it sometimes may seem, it is a story of here (literally here) and now. 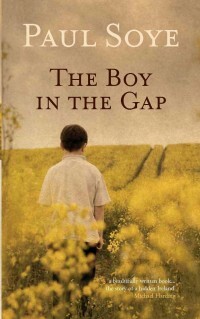 ‘The Boy in the Gap’ is a fine book and I recommend it unto you. I should also proudly say that Paul Soye is a friend of mine. When I arrived in Mayo in 1997 and word got out that I did a little writing, someone said to me, “You should meet Paul Soye, he is a real writer.” They were right, too. He is that. Because Paul is a friend, I would never really want to sit down and write bad things about his first novel but, mark me on this, if it were not good, I would not say what I am saying now; this is an excellent book by any standards which has stayed with me since I read it. It is a very fine piece of writing. When Paul launched the book in The Linenhall a few weeks ago, I helped him read a scene from it and that was one of the high points of my year. I wish I had read the whole book beforehand because I read Jack Sammon that evening as a rather forceful and angry man whereas, if I were to read him now, I think I would be more bemused, resigned and beaten-down person. ~adds book to Amazin wish list~ Thank you, Ken!